Definition at line 159 of file ASTReaderInternals.h. Definition at line 169 of file ASTReaderInternals.h. 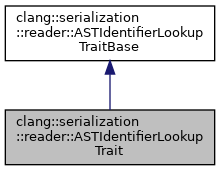 Definition at line 171 of file ASTReaderInternals.h. Definition at line 181 of file ASTReaderInternals.h. Definition at line 936 of file ASTReader.cpp. References clang::IdentifierInfo::getBuiltinID(), clang::IdentifierInfo::getObjCOrBuiltinID(), clang::IdentifierInfo::getTokenID(), clang::IdentifierInfo::hasRevertedBuiltin(), clang::IdentifierInfo::isCPlusPlusOperatorKeyword(), clang::IdentifierInfo::isExtensionToken(), markIdentifierFromAST(), readBit(), clang::IdentifierInfo::revertBuiltin(), clang::IdentifierInfo::revertTokenIDToIdentifier(), clang::IdentifierInfo::setIsPoisoned(), and clang::IdentifierInfo::setObjCOrBuiltinID(). Definition at line 920 of file ASTReader.cpp.